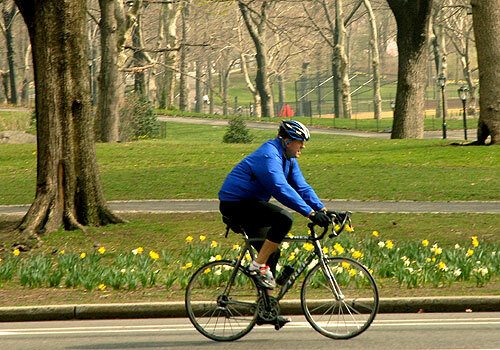 With its scenic views and hilly terrain, the Central Park Drives provide cyclists with a relaxing ride or a challenging workout, depending on their interest. The Drives are shared by runners, walkers, skaters, horse carriages, and more, and they can be very congested on weekends and nice days. Plan your route with the Central Park Bike Map. At crosswalks, slow down, yield to pedestrians, and then proceed cautiously. Obey all traffic laws, such as traffic signals, stop signs, and the maximum speed limit of 20 mph. Obey all ONE WAY signs and arrows: Travel only counter-clockwise on the Drives that circle the Park. Cycling is prohibited on all pedestrian paths except the marked shared paths at 96th St and W. 106th-108th St. Rent bikes through BikeRent NYC, which operates at two locations on a seasonal basis. Rentals are on a first-come, first-served basis. For more information, please call the numbers below.